Basingstoke ‹ Series 7 ‹ Flog It! The team are in Basingstoke where James Lewis takes a look at a truly ancient artefact - a genuine Roman bowl. Catherine Southon falls for a stunning 1920s toy car. Browse content similar to Basingstoke. Check below for episodes and series from the same categories and more! Today, we're in a town with a troubling case of mistaken identity. Often thought of as a new town, it has a colourful, vivid history. 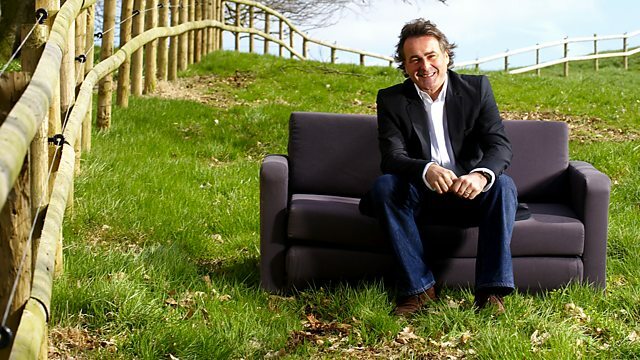 This is Basingstoke and you're watching Flog It! Basingstoke's history stretches back over 1,000 years. It has everything any self-respecting British historic town should have. It's even named after a fearsome Anglo-Saxon tribe, the Basingas. What other historic delights prevail? Well, there's a nice, straight Roman road. An Iron Age fort, now protecting a school, was the site of a major battle in the English Civil War. into the modern town we know today. And completing your Flog It team today are proficient experts Catherine Southon and James Lewis. Today's venue is The Anvil. So let's hope these two have enough mettle to hammer out some cracking items. -Eileen, I love this piece. Thank you for coming along. Now, it's no ordinary map. and it's a map of the post roads of England and Wales. All these little roads are the mail routes. Where did you get this from? and originally, his aunt gave it to him. -We've had it round about 39 to 40 years. -Unfortunately, it's just been in a drawer. -He was not interested in maps? -That's such a shame. I love maps and globes. They're so interesting. You've got a lot more counties than what we know of today. Norfolk looks a different size and shape to what we're familiar with. That's what I like about globes and maps. As the centuries and decades progress, we find more geographical information. Here we've got the "British Ocean". Obviously, now we know it as the North Sea. Once upon a time, it was the British Ocean. What is a pity about this is that it's not in terribly good condition. There are some holes here which has occurred as it's been folded up and popped into the wallet. Now, value-wise, I would probably put around £100 to £150 on it. -Yes. What were you hoping for? I had no idea at all and that's a little bit of a shock actually. I actually hope it would make a bit more than that. Ron, of all the things that come to the Flog It tables, boxes and bits of wood like this are my favourite. made from a South American wood that smelled of roses when the tree was cut down, so it's called rosewood. Then into that rosewood we have the brass stringing around the outside. Then in the centre we've got mother-of-pearl. Those are mother-of-pearl diapers and they alternate with abalone. So it's quite fussy. It's quite feminine. probably made 1840 to 1860, somewhere around there. -As long ago as that? Now, if we open it up... Look at that, fantastic. We now know this was a travelling box. -you see the holes through it? That's so that whatever was inside didn't go mouldy. -So we know it was something that would've been wet. and then this one... Holes again. -I have no ideas at all. I didn't know it was that old, to tell you the truth. The only history I know about it, I had an elderly cousin or aunt lived on the Isle of Wight. and unfortunately, he was killed in the First World War. And I think she left a photograph in one of these things. "Lieutenant Treharne, Welsh Regiment, died of wounds." What you should do is write down the history of that box and just put it in the soap box with that. -so if you wouldn't mind doing that? -I can do that, yes. -let's put a reserve of maybe £200? I think it'll do jolly well. I'm very pleased you brought this box. -June, this catches your eye. It's a showy piece. Tell me a bit about how you came by this charger. A friend of mine was moving from Oakley down to Torquay and she was moving into a much smaller house. -Downsizing. But I like de-sizing. she gave it to me and it was in pride of place on my sitting room wall. -Do you know where she got it from? -I have no idea, but she originated from Cornwall. You've heard about the Newlyn Industrial Class which was started by John Drew MacKenzie in 1890. He was an artist and he felt sorry for the plight of the fishermen. he thought, "I'll teach you some traditional skills. "They repair their boats with sheets of copper. They'll be good at working with metal." So he got them to hand-hammer lots of objects in copper. but I've looked all over this and I'm not sure if it is from Newlyn. and with the Keswick School, a massive stamp shaped like a diamond. -it makes it Keswick School. -and maybe little bubbles like fish bubbles. It is so stylised. It's so of the period. I love it. I would say this is definitely 1910, 1920. -It's been beautifully hand-hammered and it would look really nice on a table top in a big hotel. On the right piece of oak furniture. Value, right, OK... I wish it was stamped because then it would be worth £400 to £600. -but I'd like to put it into auction estimated at 60 to 100. I'm pretty sure you'll get the top end. -Would you like a reserve on this? -I didn't think it would be as much as that. It's pretty. I think it's worth a lot more than £40. We're gonna find out, that's for sure. Christine, you've brought in something that's probably the oldest thing in the room. Well done. -Tell me all about that. -It's just a family friend who gave it to us. We've kept it just in a box really. Now and again, I get it out and have a feel because it's so old. And to imagine the people before you who had used it is fantastic. -Where did your friend find it? -I haven't any idea at all. It's just something that's cropped up. What we're looking at there is a wonderful piece of Roman pottery. Known as Samian Ware for this very shiny red glaze. in the 2nd, 3rd and 4th century AD. "Priscuse." Strange, really. I wonder why they've put that across the centre of a bowl? It reminds me of a Roman oil lamp that I brought back from Turkey. Again round one of these brocante type stalls with bric-a-brac and wonderful bits and pieces. I got so excited, brought it home and it had across the back "taklit". I thought, "I wonder if it's a Roman site or something like that?" I looked it up in my Turkish book and it said, "Taklit - Turkish word for 'fake'." No, I'm confident that this is a really good early piece. What that means, I don't know. It could be a person's name, a place. And all this surface damage here is exactly what you'd expect to see. when something has been in the ground, so I am totally convinced that that's right. Value? Roman stuff doesn't make a lot of money. It should make so much more than it does. It's greatly undervalued. We ought to estimate it at £60 to £100. Let's protect it with a reserve of 50. If it doesn't make that, you might as well put your soap in it. If it's not worth £50, it's not worth selling. I'd pay £60 to £100. We've found some cracking items and right now it's time to put those valuations to the test. It's our first visit to the auction room in Winchester. Here's a quick recap of all the items we've found. Catherine had a special delivery with that postal road map, but will the bidders be guided to the lot? James spotted this fine Victorian travelling box. It should sail out of the auction room. Next up was this magnificent copper plate. I'm confident someone will fall in love with its rustic charm. And finally, it was James with a genuine Roman bowl. Let's hope there's a legion of bidders. Our auctioneers for the day are Andrew Smith & Son. On the rostrum today will be the man himself, Mr Andrew Smith, and his colleague, Nick Jarrett. This is where we put our experts' valuations to the test. It's a packed room full of bidders. Our owners are here and our antiques are ready to go under the hammer. One of our experts is missing. Catherine is here, but James cannot make it. He's in Derby. We've got a camera on him and a phone link to get his reaction. Watch this. We're gonna sell some antiques. First up, Christine with that Roman bowl. and they're worth a lot less than antiques that are 100 years old. -Can you imagine the people that have handled it? -Yes, the stories it could tell! If only this saucer could speak. That's why James loved it. -As you know, I love this Roman stuff. I hope it'll do well and somebody will love it as much as I do. This is a fantastic lot. Lot 460, this is the Anglo-Roman bowl. £60 bid, thank you, and 5. At £65 then. Any more? At £65, are you all done? With you, sir, at £65... 70 down here. And 5. 80. And 5. 90. And 5. 100. And 10. Good. This is more like it. £120 seated. I'm selling... 130 at the back. 140...? Oh, they love it, they love it. At £130 with you, sir. £130. Is there any more? -£130, great price, I'm so pleased with that. People loved it and that's gonna go to a good home. -I hope they enjoy it. -What are you gonna put that money towards? I think I'll donate it to a charity. -Because it was a gift to me, that's what I'm gonna do. I like this next lot. It's a little post map of England and Wales. Right now, all roads lead to Itchen Stoke near Winchester where we've been joined by Elaine and Catherine. -Can we get £100 for this today? -I think we should. It's very tactile. -You want to pick this up, study it and not put it down. -It's great. It's got a bit of wear to it. Let's hope we flog it. We'll find out right now. Here we go. Lot 101 is the late 18th century map by John Wallis. Start me at £100? £100? £100? 80 then? £80? 60 if you like? £60. £60 bid, thank you. And 5. And 5. 80. And 5. -At £80 and we're selling. All done at £80? Last time then at £80...? -It was nearly 100, wasn't it? I would've liked a bit more. I'm a bit disappointed. I'm greedy. -You're not allowed to. Happy? -I think that's lunch out. So we'll have a meal when we're out and say thank you to Aunt Nell. Aunt Nell who gave it to you. And escape this rotten British weather! I've been looking forward to this. It's been a long wait since the valuation. Lovely copper charger. It's not too big and it's got the look. Any second thoughts? -Do you want to take it back home now? -No, I want to put a reserve on it. We'll be all right. Let's put it under the hammer. Here we go. Lot 720 is a large hammered and pressed copper charger. Let's start at £60. £60? 40 if you like? £40? 30 then to get going? £30? Up at the top there at £30. 32. 35. 60? 55 here. Is there 60? At £55. At £55 then if you're all done? Last time? -Yes. We did say 60 at the bottom end. Ronald, it's good to see you. We're just a few lots away from selling that lovely rosewood box. -James put a value on it of £220 to £280. I know it means a lot to the missus. -She doesn't want it to go for anything less than £200. -The pressure is on James. What do you think of the room? There's antiques everywhere, but right now there's only one place to look and that is the rostrum. Lot 240, the dressing case. A handsome case with all its fittings. 1852. -The wife's happy. That's the main thing. At 290. 300, is it? And 10. 320. 330. 340. 350. 360. 360 down here. -Come on, let's hope for 400. At £360 sitting here. At 360, are you done...? -Yes! Three hundred and sixty pounds! -Well, I'm in two minds. as a centrepiece on the sideboard. James, we got £100 more than your top end. but that is a really good price. Well done, both of you. £360 - that's a good result. to the very place where a simple country pursuit evolved into the game we know and love today. this unlikely looking spot was the epicentre of the cricketing world. This is Broadhalfpenny Down near the village of Hambledon in Hampshire. that the Hambledon club dominated both game and the stewardship of cricket. and the first universal rules were established. Much of that momentum of change flowed from this very ground. Bob Beagley is an Honorary Vice President of the present-day club. Since a young man, he's taken a keen interest in the club's colourful history. So, Bob, put the Hambledon era into context. What was cricket like when the club was first established? Well, it was a game very much as it is now. The equipment has changed. The bat was more of a club. They often say it was evolved from a shepherd's crook. The wicket was two stumps, not three. -Cricket originated with two stumps? -Yes, which was called the wicket. -Could you get somebody out if it went through? -You could be in all day long. -You could. You had to hit the stumps to get them out. -You gonna bowl me a couple? Of course. They were all underarm. -That was a stroke of luck, really! -Beginner's luck. Let's go to the pavilion. Looks like there's a few guys about to have a practice. Tell me more history of the club. Well, the club came into existence somewhere about 1750. The club at that point was mainly concerned with drinking and eating, I think. Exactly the same, yeah! And a lot of gambling took place. They gambled vast sums of money on the outcome of a cricket match. came to bat with five runs to win. And he was bowled three times through the middle of the stumps. So after the game they decided that it was best that we had a third stump. On a match soon after, they were playing Sussex. -And one of the characters from Sussex came out with a bat as wide as the stumps. decided a bat must not exceed four and a quarter inches. -that three stumps were used. The history of the game played today started here on this piece of turf. -And I've had a go today! It's brilliant, really, isn't it? What about the batting order? Always the same? the batting order was the Duke of So-and-so versus Lord Somebody. They were at the top of the order with the paid players below it. The best players were last. So you'll see somebody scored a century at number nine! -But there were no boundaries in those days. If somebody hit a ball into the crowd, there it stayed until it was found by a cricketer. -What if you lost the ball? -Six runs were added when the fielder called, "Lost ball!" or their headgear. Sort of an obstruction. So what happened in the end? Why the demise of the club here? and Lord's was chosen as its headquarters. Hambledon became less important and so that was the end, really. I guess it was important for the future of cricket, but a sad day for the local community. Many of the local men played for Hambledon and were employed. -Did you ever play cricket professionally? -Would you have liked to? We'd all love to have played cricket professionally. What a life. -Were you a good cricketer? -No, I made a number up! -But it is a passion, isn't it? -What better sport and what better place to play? -Exactly! No better place than this. We're back in Basingstoke now and it's over to Catherine for our next valuation. Duncan, I think we're going to swap around positions here. You're the expert on this. You've done a lot of research. a lovely tin-plate model of an Alfa Romeo. A stunning piece. Tell me where you got it from. It was my father's. I suspect he got it new. -He was born in 1913 and this is a 1924-25 car. -I suspect as a young teenager he was given it by my grandfather. And then I remember it, as a child, being in the house, although I didn't play with it a great deal. I preferred Dinky toys. Then, when my father died, it came to me. -as she'll not play with it. What do you know about the actual car? It's a beautiful model and a lovely shape as well. It was the epitome of racing in the '20s. The P2, which is what this is, came out in 1924.
which gave it a top speed of 140 miles an hour. Not bad going. we see where you put the key in. -I think that switched it on or off. That lever goes to the motor. -So you've never known it in working condition? So you never got to play with it. Apart from pushing it around, no. I never wound it up. It is in a very poor state, but I quite like that. You thought about restoring it and I am so glad that you haven't. It shows that somebody's loved this and had a great time with it. What I really like is the detail. -I love this simulated leather seats. We think 1920s in date, probably 1925, around that. In perfect condition, with its box, we'd probably be looking at a couple of thousand pounds. Collectors always want these in perfect order. -we're probably looking at £300-£500. -And hope it makes more the top end of the estimate. -Then you can buy something more girlie. Mary, thank you so much for bringing this in. It really is a classic antique. but this is something that I love. A true antique, 200 years old. -And in brilliant condition. Tell me about it. Where did you find it? -I can't remember. My husband and I were always out buying things, every Wednesday and Saturday. If we had enough money, that was it. Where it actually came from, I can't remember. -He did a lot of work on Wellington's Stratfield Saye House. Yes, so we got quite a lot of Wellington memorabilia. "Lord Wellington", before he was made a duke. And it is inscribed, "Lord Wellington entering Paris". -but Lord Wellington entered Paris in March, 1814. -Two months before he became a duke. So I think this is Wellington leading his army in the Napoleonic Wars. but it really tells a story of British and French history in the early 19th century. -Why aren't you keeping it? -and whereas I had five downstair rooms, I've now got a room and a kitchen. So I've got things stashed away. That was over the fireplace and I thought, as it's local, it might be interesting. OK, value. If by a good artist, it would be worth a lot. But...it's an early tray and it's early image. -I think an auction estimate of £100-£150, with a reserve of 100. -Let's take it and flog it. Anne, welcome to Flog It. You've brought these rather interesting scientific instruments. Tell me about this microscope. Where did you get this from? -but I'm not quite sure where from. -Right. You don't know what country? -I'm not sure about that. They were working before Nachet. They were working between 1860 and 1870 together. And Nachet then took over this company. and it's known as a compound microscope, rather than a binocular one. A nice compound microscope. Did you ever use this? Oh, yes, but under supervision from my father as a youngster. We'd have a look at slides and put sugar under it! I like it because it's slightly earlier than I originally thought. I would probably think it would be worth around £150, around that sort of price. This is more interesting. Let's move on to this piece here. Now this here is a rather interesting microscope. This is a travelling microscope. by sliding this in here. That's actually your stage, where the stage clips on. You put your slide in here. And then this mirror would go into here. This is slightly earlier in date. I'd probably say around 1840. So this one didn't come back...? No, that was bought for my father when he was a little boy. -Was your father interested in...? -A lot of the slides have got fly wings and all sorts on them. -Let's look at the pieces inside. Oh, I can see here. How lovely. He's labelled these all up. "Wing of greenfly". You're happy to get rid of them? -I've got three sons and you can't really split them. -You can't. You could give each a specimen! You're probably doing the right thing. They don't command as high prices as they used to. -and sell them both with an estimate of £400-£600. -And reserve them around 350. How does that sound? -Hope they find a good home. That's another three items in the bag and off to auction. Duncan made Catherine's day with this classic toy car. With so much style and character, it'll drive up the price. Mary's tray showed Lord Wellington marching into Paris. Let's see if it attracts an army of bidders. And Anne's microscope made a great double act - twice the attraction for all those collectors. where the auction is underway. We've got two microscopes up for grabs with a value of £400-£600. -They belong to Anne and were your father's. -Time to let go now. Happy with the valuation? You came to the right expert. Catherine is our science buff. Well, I'm just a little concerned. I'm used to putting estimates on things for specialist auctions. I think they might be a little bit lost here. -Fingers crossed that the buyers found them on the internet. Lot 735 is the Victorian brass microscope. -A number of commission bids. So we'll start the bidding at 300. Is that 320? At £300. Any more? -At £300. All done at £300? I can't sell at that price. How confident were we? "Bidding starting at 300." -Well done with the reserve. -They are worth that. If you are going to sell, put the same estimate on. It just wasn't quite there. Almost. So near, yet so far. Expert James Lewis can't be with us today, but he's on standby down the line from Derby. Mary, fingers crossed. Let's hope we get that £150. Remember the tray with Lord Wellington and Paris. We've got £100-£150 on it. It is protected. You've put a reserve on it. -We don't want to give Wellington the boot. Lot 675, this is the Regency tray. Interest in this. We have a commission bid. I'll start at £90. Is there 5? At £95. 100 in the corner there. And 10? At £100 and selling. Is there 10? At £100, then. At £100 for the very last time. Bottom end of the estimate. Got it right, James. -Catherine seemed very disappointed that the microscope didn't sell. It's another of her lots next. Could it be double trouble? I'm feeling quite excited. It's our favourite thing in the sale. It's the gorgeous 1920s tin-plate car. It belongs to Duncan, who's taking it in his stride. -You're really confident and cool. We've fallen in love with this. One of the nicest things I've seen on the show. I had a chat to Andrew the auctioneer. He said the condition lets it down, but it has been used a bit. And it's of a certain age, so it's rough round the edges, like all of us! -I wouldn't be selling this. -No, as I said, it doesn't have all those memories for me. I've got things of my father's that I remember very well. -But we never played with it. -And you can cherish those. And this has been in a box. At least it's got four spare tyres! It's got the look. It's a good gentleman's toy. Lot 660. I'm going to start the commission bids at £800. Is there 50 in the room? -Doing battle on the phones now. We've done it. At £1,100 commission bid. Is there 50? At £1,100. And 50. Commission bid is out. 1,200. And 50. 1,600. And 50. 1,700. -£2,500. On the telephone at £2,500. At £2,500. For the very last time. -Thank you for bringing it in. That's made your day. -What will you put that towards? -As I said to Catherine, we've just had a granddaughter. -So it will go into a fund. Can't get a better start. -What a great start. What's her name? -I didn't realise it was that much of a corker! That's brought the show to a wonderful climax. If you've got anything like that, bring it along. We'd love to see you. Join us next time for many more surprises on Flog It. Paul Martin is joined by antique experts James Lewis and Catherine Southon as the Flog It! team descend on Basingstoke. Amongst many fascinating items discovered, James takes a look at a truly ancient artefact - a genuine Roman bowl. Catherine falls for a stunning 1920s toy car, and Paul unearths a large copper plate with an intriguing decorative pattern. Paul also takes a trip to Hambledon, a sleepy village in rural Hampshire, which for a period in the 18th century was the very epicentre of the cricketing world.